My name is Jack Longman and this is The BiteSize Jacketendo Review. Whereas The Jacktendo Review is my very own two-in-one game review that caters to all kind of readers as it consists of both a fast and a short review and a slow and long one, the BiteSize version skips the lengthy review. Instead it is a singular, smaller review that wastes no time in getting to the point and undergoing The BiteSize Jacktendo Review today, is the remastered and newly released Hyperlight EX for the New Nintendo 3DS. 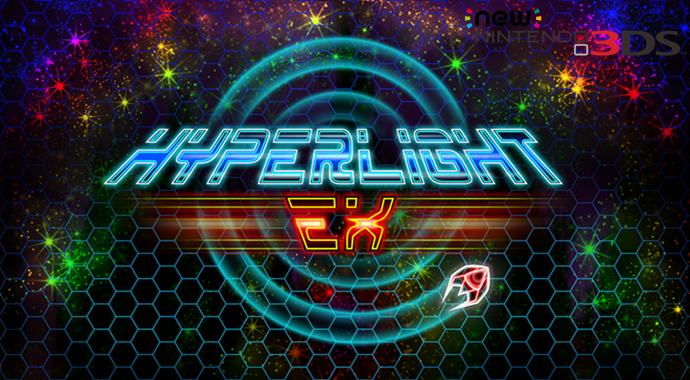 Developed by CatfishBlues Games and previously released on mobile devices as Hyperlight, Hyperlight EX is the same arcade space shooter a lot of us feel in love with, except now it has three modes instead of two and it has never looked better! As far as a story goes, there isn’t one, but there is an Arcade Mode with has over 50 levels for you to play, levels which include mid-boss stages and big bad final boss battles and if you get bored of that, then there is also Infinity Mode, which has a ton of levels and several mid-boss stages! Also, for anyone who doesn’t find those two modes to offer them too much difficulty, there’s the new Panic Mode, which is a lot like the others, except movement is done via tilt control! In a lot of ways, Hyperlight EX reminds me a lot of the space shooters I used to see and play at any arcade I encountered, I’ll be honest, I was never really good at those type of games, and I’m not all that great at Hyperlight EX either, but the more I play it, the better I get, so maybe in a month of two I’ll own it like a boss, but I will need to put a lot of hours into it. But that isn’t a bad thing, because firstly there are too many games out there that are just too easy to play, plus Hyperlight EX is every bit as addictive as Hyperlight was, so playing for hours on end is not an issue, especially when EX is the definitive version. Plus there’s meals, 7 bonus weapons, which includes Machine gun, Globe and Virus. There’s even 3 bonus entities, so if you loved Hyperlight, than you will really love this one and the techno music isn’t bad either. For an indie game that a number of us have played already and costs $5.49 US dollars (€5.49 euros/£4.99 pounds), the addictive hours of gaming it will give you, more than makes up for it, plus let’s be honest, who can really say no to an arcade game that plays perfectly on 3DS? I sure as hell can’t and since Hyperlight EX, is the only CatfishBlues Games we can expect come to current Nintendo platforms (they’re words not mine,) that alone should be a good enough reason to buy it. So with this paragraph and everything above said and done, I can now reveal my final score for Hyperlight EX and it scores itself a deserved 7/10! Is this game on the Unity engine?